viaLibri ~ THE EARLY MORNING MILK TRAIN. The Cream of Emett Railway Drawings. Signed and inscribed by artist, with a large original drawing. THE EARLY MORNING MILK TRAIN. The Cream of Emett Railway Drawings. Signed and inscribed by artist, with a large original drawing. Brattleboro, VT: Stephen Greene Press, 1977. 149 black & white drawings. Hardcover binding. Unclipped dustjacket with minor rubbing to extremities, including a small closed tear on front panel; protected in archival mylar. 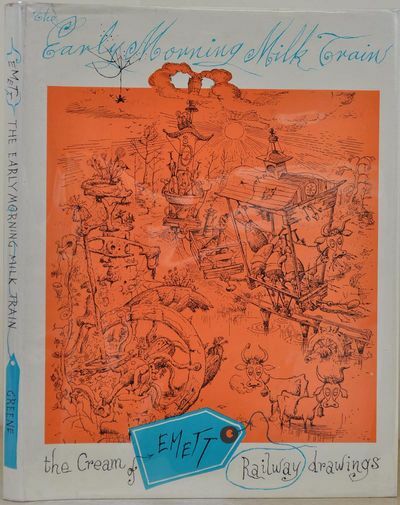 Signed and inscribed by illustrator on preliminary page "For Annette, with all good wishes + admiration from Rowland Emett British Showcase, Chicago, Sept 1977." There is also an original drawing (in blue ink) on the front endpapers, comprising a butterfly-powered flying machine flying over Chicago, showing the Sears Tower and Hancock Building. The pilot's companion's exclaim "We'd better get down pretty quick! The butterflies are running out of steam...!" and "There's a lovely spot! A Marshall corn Field [obviously referring to Marshall Field department store, now Macy's]. A man on the ground is running from the "corn Field" carrying a tree combined with the form of a crying person. A statement is provided by Emett: "NOTE: This Feather-tree is despondent." A unique offering of Rowland Emett and a superb example of his creative and whimsical form.. Signed. First American edition. Hardcover. Near fine condition/Very good+ condition (DJ). Quarto (4to).